YOGYAKARTA- MD FEB UGM Program held Design Thinking Workshop on Friday, May 11th, 2018 at the Learning Room MD FEB UGM Building. 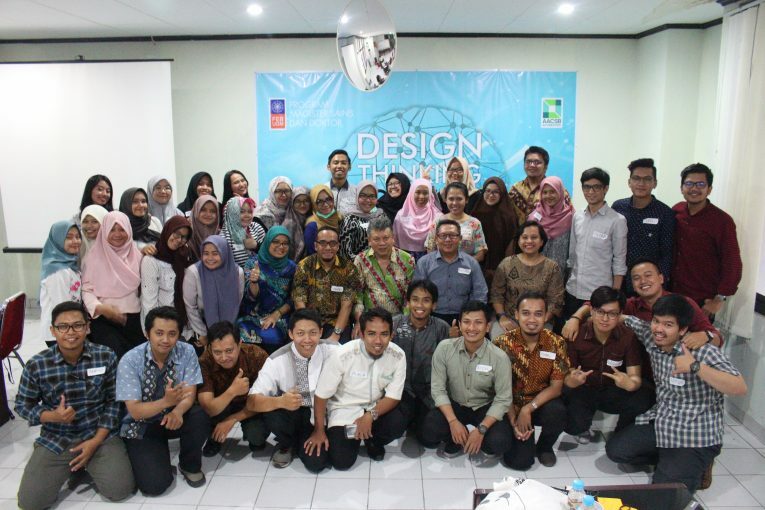 The facilitators in this workshop were Fathul Wahid, M.Sc., Ph.D. and Mukhammad Andri Setiawan, M.Sc., Ph.D. Both facilitators are lecturers in the department of informatics engineering at Universitas Islam Indonesia. Prof. Jogiyanto Hartono as the coordinator of MD FEB UGM Program opened the workshop by giving an opening speech. In his speech, he said that this workshop was held the effort to improve students’ soft skill. Fathul Wahid, M.Sc., Ph.D. explained that facilitating the workshop is an attempt to teach and encourage students to think differently and innovatively. Fathul then presenting the fact about perception difference between fresh graduates and employers. Seventy percent of new graduates consider that they have critical thinking that is useful in work, but only 30% of employers agree with the statement. Based on these facts, there is still a gap between the ability of new graduates and the expectations of the company (employer). Therefore, improving the ability of critical thinking is important in the current education and design thinking workshop is one solution to hone the ability to think critically. To hone and enhance students’ creativity, the facilitator formed 8 groups of 5-6 students. The formation of this group aimed to make students more familiar with colleagues and more focused on solving the given problems. Furthermore, the facilitator invited the students to be creative with the games provided by the facilitator. The games given in this workshop work as a medium for implementing the workshop materials, as well as problem-solving. At the end of the game, the students who have been divided into groups are invited to solve the problem by implementing it through mock-up making. The Material for mock-up itself consists of paper with various forms. The students seemed very enthusiastic in this session, they coordinated each other and discussed what they would do, and discussed the philosophy of the model itself. Furthermore, at the end of the session, the students presented finished mock-up and explained the meaning behind their mock-up model.